Showing you how I made a miniature White Castle meal. You can add headpins to turn them into charms for jewelry or leave them as is and give them too a doll…. WASHINGTON — Michelle Obama will begin digging up a patch of the South Lawn on Friday to plant a vegetable garden, the first at the White House since Eleanor Roosevelt’s victory garden in World War II. There will be no beets — the president does not like them — but arugula will make the cut. Whether there would be a White House garden had become more than a matter of landscaping. The question had taken on political and environmental symbolism, with the Obamas lobbied for months by advocates who believe that growing more food locally, and organically, can lead to more healthful eating and reduce reliance on huge industrial farms that use more oil for transportation and chemicals for fertilizer. Then, too, promoting healthful eating has become an important part of Mrs. Obama’s own agenda. The first lady, who said that she had never had a vegetable garden, recalled that the idea for this one came from her experiences as a working mother trying to feed her daughters, Malia and Sasha, a good diet. Eating out three times a week, ordering a pizza, having a sandwich for dinner all took their toll in added weight on the girls, whose pediatrician told Mrs. Obama that she needed to be thinking about nutrition. “He raised a flag for us,” she said, and within months the girls had lost weight. While the Clintons grew some vegetables in pots on the White House roof, the Obamas’ garden will far transcend that, with 55 varieties of vegetables — from a wish list of the kitchen staff — grown from organic seedlings started at the Executive Mansion’s greenhouses. The Obamas will feed their love of Mexican food with cilantro, tomatillos and hot peppers. Lettuces will include red romaine, green oak leaf, butterhead, red leaf and galactic. There will be spinach, chard, collards and black kale. For desserts, there will be a patch of berries. And herbs will include some more unusual varieties, like anise hyssop and Thai basil. A White House carpenter, Charlie Brandts, who is a beekeeper, will tend two hives for honey. The total cost of seeds, mulch and so forth is 0, said Sam Kass, an assistant White House chef, who prepared healthful meals for the Obama family in Chicago and is an advocate of local food. Mr. Kass will oversee the garden. 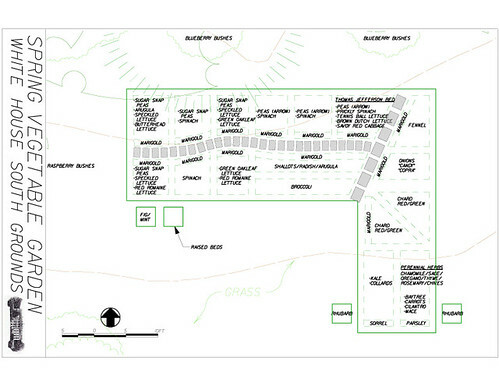 The plots will be in raised beds fertilized with White House compost, crab meal from the Chesapeake Bay, lime and green sand. Ladybugs and praying mantises will help control harmful bugs. Cristeta Comerford, the White House’s executive chef, said she was eager to plan menus around the garden, and Bill Yosses, the pastry chef, said he was looking forward to berry season. The White House grounds crew and the kitchen staff will do most of the work, but other White House staff members have volunteered. For children, she said, food is all about taste, and fresh and local food tastes better. “A real delicious heirloom tomato is one of the sweetest things that you’ll ever eat,” she said. “And my children know the difference, and that’s how I’ve been able to get them to try different things. For urban dwellers who have no backyards, the country’s one million community gardens can also play an important role, Mrs. Obama said. But the first lady emphasized that she did not want people to feel guilty if they did not have the time for a garden: there are still many changes they can make. A fresh take on a traditional salad, this recipe incorporates pea shoots and Romano cheese to give vibrant bursts of flavor to an otherwise ordinary dish. Create healthy, wholesome dishes with helpful hints from an organic gardener in this free video on garden-to-table cooking. 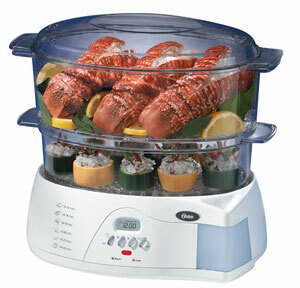 6-quart total capacity for steaming meat, fish, vegetables, and more. User-friendly push-button control panel with LCD display and quick reference guide. Exterior water-level indicator and exterior water-fill inlet for no-interruption filling. 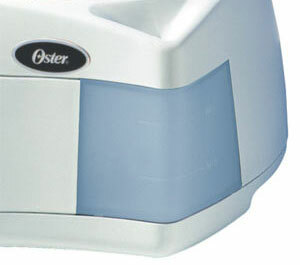 Cook healthy, delicious dinners at home with help from Oster’s easy-to-use electric food steamer. Whether gathering food from a favorite store, local farmer’s market, or from your very own vegetable garden, the food steamer makes it fun to indulge in nature’s bounty all year long. Use the food steamer to prepare a variety of entrees and side dishes–anything from savory jasmine rice, wild-caught fish, or farm-raised chicken to the whole gamut of fresh or frozen vegetables, including artichokes, asparagus, summer squash, red potatoes, and more. The versatile 6-quart food steamer provides a double-tiered design and two stackable transparent steaming bowls–a large 3-4/5-quart steaming bowl and a 2-2/7-quart steaming bowl–that make it possible to steam two different foods simultaneously, without any cross-over of flavors. The large steaming bowl can also be used for cooking up to eight soft- or hard-cooked eggs at a time–great for springtime holidays, Sunday brunch, or as a healthy on-the-go snack throughout the week. For rice, simply add the rice (or other foods with sauce or liquid) to the included 10-cup-capacity rice bowl. Place the rice bowl in the lower steaming bowl and cover with the lid. The food steamer takes it from there. Start cooking right away thanks to the unit’s instant-steam function. The food steamer’s powerful 900-watt heating element quickly heats the water in the reservoir, automatically and instantaneously generating steam. Even more, its exterior water-level indicator makes it possible to monitor water levels at a glance, while its exterior water inlet on the base of the unit offers a convenient way to add water during the steaming process (no need to remove the steaming bowls). 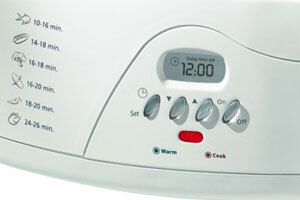 The food steamer’s push-button control panel includes an LCD display with a 95-minute timer (the maximum cook time), a red “cook” indicator light, a green “keep-warm” indicator light, an audible “ready” signal, and an on-board reference guide that lists cooking times for popular food items. Cooking can be delayed for up to 12 hours, and the food steamer’s automatic keep-warm setting will maintain an ideal serving temperature (for up to an hour) while the finishing touches on dinner are being made. Other highlights include integrated side handles on the steaming bowls for a secure grip, a secure-fitting lid to help trap heat and moisture, a drip tray to catch drips and spills, and an easy-to-clean design (most parts are top-rack dishwasher-safe). 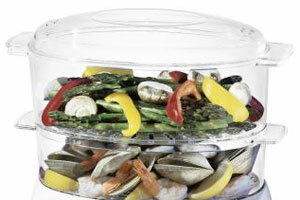 Even more, the bowls nest together, which allows for space-saving storage in between use.